Sweet and nutty being just our kind of thing, granola is always a welcome snack. The sweeter version of granola, granola bars can only be more welcome as a delicious, on-the-go snack .But of course, I must be vain and tell you that I don't care much for the ready sugar-loaded 'health' bars with a dis-proportionate amount of rice krispies, almost no nuts, sometimes slathered with milk chocolate. There are imported brands which are good but burn a hole in the pocket? Honestly, I haven't cared enough to search or splurge on these. Like a lot of us, I would rather make my own. Even if just the nuts burn a small hole in my pocket. We love nuts, so please don't even tell me you have a recipe for granola bars without nuts, I would not enjoy that as much. But I do wish baking 16 bars of nutritious bars don't feel like luxury! Oh yes! just when you thought you have heard all my pet-peeves - power cuts, small ovens, elusive baking ingredients and impish kids, I am now cribbing about how expensive baking nut-loaded goodies I find. Specially when the goodies are easy to bake and don't last very long! I have baked these chewy granola bars from Deeba's PAB a couple of times, once with less nuts, more of oats. Once by mistake added double the amount of oatmeal specified in the recipe. And once almost the same recipe proportions. And each time, the texture was different, but they were always tasty! The bars with more of oatmeal gave me slightly crunchy bars, the bars with the original amount of oatmeal were soft and chewy, think the texture of coconut fudge ( traditionally made on the stove-top). Lending itself to a lot of variations, these bars are great to play around with. I have used more of nuts, less of dried fruit (chopped dates) and some unsweetened coconut flakes. I prefer less of dried fruit as I wanted the bars just about sweet without tweaking the amount of other sweeteners. I had once used raisins in my granola and granola bars, but did not like the way they tasted after they were baked. I shall be trying the bars with chocolate chips on popular demand (from the kids of course!). But I shall then leave out any dried fruit to maintain the same level of sweetness. 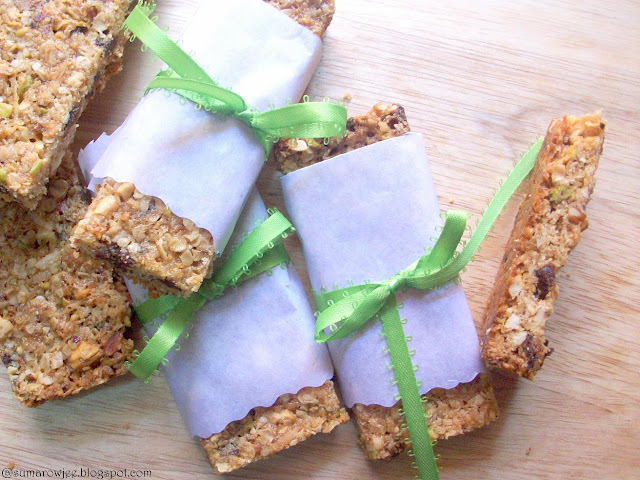 Chewy Granola Bars, adapted from PAB , recipe from SK original recipe from KAF .Whew, but three of my fav sites in one post! 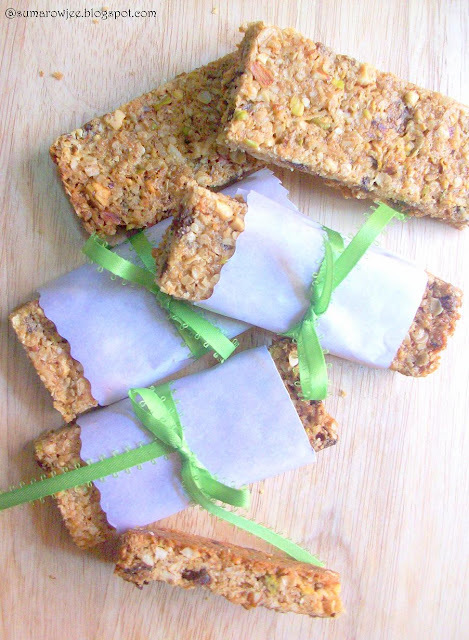 I have halved the original recipe as I wanted thinner bars, used less of dried fruit. The rest of the recipe proportions are the same as Deeba's, except for the omission of peanut butter. The texture and taste again being a matter of personal taste and preference, you may need to experiment a bit to find out what you like best. Procedure: Pre-heat oven to 180 degrees C / 350 degrees F. Lightly grease and line a 8'' square tin with baking parchment leaving an overhang. Combine all the dry ingredients in a medium sized bowl. Whisk together all the wet ingredients in another. (Measure the oil first, then honey and corn syrup for ease) Combine the two, mix with a spatula. The mixture may appear to be dry when you begin to mix, but will gradually come together. It will be wet but still crumbly (If you use peanut butter, it may be less crumbly). Transfer the mixture to the baking tin, move the mixture to cover the pan, press down firmly with the spatula. Bake for about 20 minutes, till the edges turn golden brown and the top slightly golden. The center and a bit of area around the center will feel soft and you may think its undercooked, but the bars will set as they cool. If using PB, and if using butter in place in place of oil the baking time could be more. Goes without saying, if doubling the recipe and baking in an 8'' square pan, your baking time will be more (30-35 mins) and the bars thicker. Cool the bars in the pan on a rack for about 5 minutes. Cut the bars when they are still warm as they will be difficult to cut when they cool, set and harden slightly. Use a dough scraper to help cut easily. Cool the bars completely on the rack, store. You could store them wrapped individually or in a single layer in a box. If storing in layers, use parchment in between. The bars are best stored in the fridge in humid weather, these freeze very well. Nuts: I have used different combinations of cashew, pistachios, walnuts and almonds (I just put them all in a a plastic bag and bash with a rolling pin) sunflower seeds, melon seeds. More suggestions as given in the original recipe are chopped dried apricots, chopped pecans, sunflower seeds, walnuts, sesame seeds, pumpkin seeds, dried cherries or apples, or even chocolate chips. Oats: I like to put the oats in a colander and shake off the almost floury part and then weigh/measure. Corn syrup - I have used light corn syrup, you could try getting this at Nilgiris, the Brigade Road outlet had this. Or try substituting with liquid glucose (available at GFA) . The recipe on the KAF site uses sticky bun sugar, the suggested close substitute is a mixture of sugar, corn syrup and melted butter, Deeba has changed the recipe accordingly. 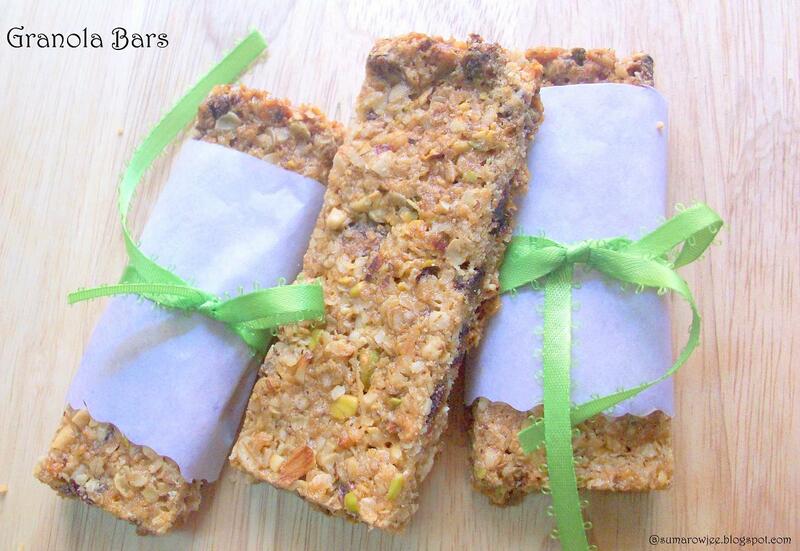 Thanks Deeba for this recipe, my oats-disliking daughter loves these bars, son keeps hinting that he can eat something 'healthy, quick and delicious' before he goes to plays cricket! My mother loved these as they remind her of Antina Unde (Gaund Ke Laddoo) .. may be the combination of coconut, nuts and dates at work? Wonderful that you have an eggless version. they look so crunchy like Nature's Valley bars. 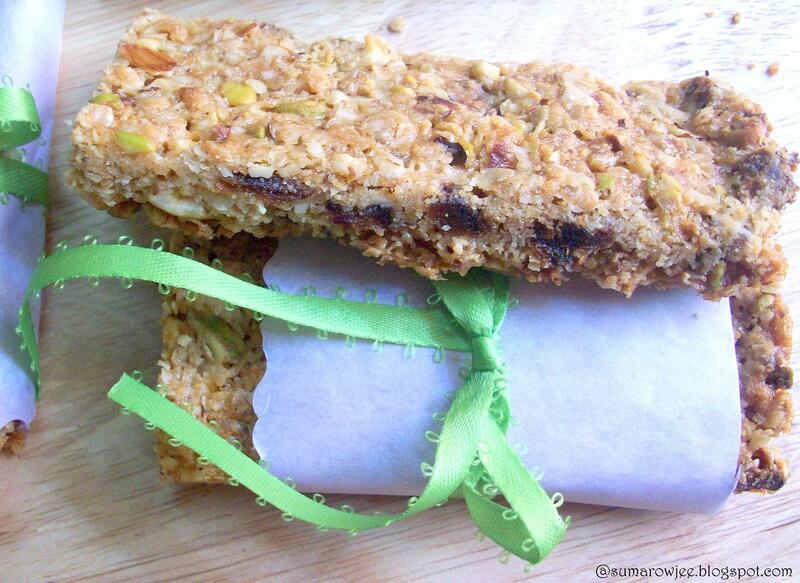 i have tried making muesli bars once and failed miserably. it dint hold shape. want to try this but I dont have corn or glucose syrup. any other easily available substitute you can think of? Wont mind to start my day with this healthy,chewy and addictive bars. Chocolate Truffles - From The Truffle Lady!